Right. I am not sure where to begin this review. I can't remember why I bought this book but I think I just liked the sound of it and then last week, I was flying out for a weekend trip and I thought that I would give it a go. And I am so glad that I did. It could easily have ended up gathering dust on my shelf because I just hadn't gotten round to read it. But I did and it is great! In an exceptionally confusing way. However. That is not all. While this story unfolds, every now and then it is broken by emails from the author of the book William Mendez. 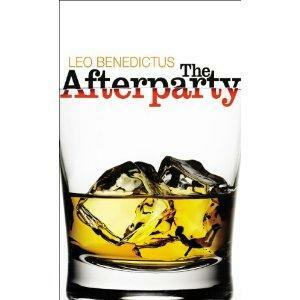 Hold on you say now, wasn't the author called Leo Benedictus? Yes, that is the name on the cover of the book. And I don't think I can say a whole lot more because I can't explain it anyway. Confused much? Let me quote Sam Leith in his review of "The Afterparty": This is a book within a book, based on a true story. Well, not true-true. That is to say, the true story that is fictionalised in "The Afterparty" (the book-within-a-book) isn't actually true: it is a figment of the imagination of the author of The Afterparty (the book under review here). If you like a bit of post-modernist writing with a strong sense of humour and a purpose as well, this book is for you. It focuses on the shallowness on our obsession with celebrity on the fact that behind every paparazzi picture in a magazine, there is a real human being. And it messes with your head. Big time. In a very entertaining way. Read it if: You like books with an edge. You don't mind thinking "what on earth is going on??" every now and then. Or if you've ever found yourself believing the crap that they write in the tabloid press. Agree :-) There is no doubt with this one. It as actually really really cool.